Normal Life paralysed in Dibrugarh district because of the 10 Hrs bandh called by various organisation. 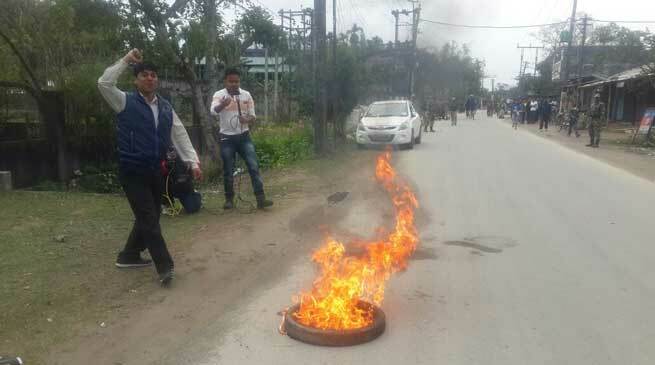 The band supporters protested in front off CM’s residence at Lakhinagar and burnt Tyres. The Dibrugarh district unit of Tai Ahom student’s union, Chutia Student’s Union, Koch Rajbonshi Student’s Union, Adivasi Student’s Union, Gorkha Student’s Union and Brihattar Asomiya Yuva Mancha have called the today’s Bandh demanding arrest of Subodh Biswas , the mail accused of Silapathat incident. On the other hand AASU is going to organise a massive “GANA SATYAGRAHA” on 11th March’17 in Dibrugarh in protest of the Silapathar incident. It will start at 11am from Polo ground and end at Chowkidinghee field covering different areas of the town. The Dibrugarh district unit of AASU has requested all sections of people irrespective of caste-creed to participate in large numbers.